Okay, y'all, I drank the kool-aid and I'm officially on the PUMPKIN PUMPKIN PUMPKIN EVERYTHING bandwagon. Yes, that's a thing -- have you not noticed our annoying club yet?! 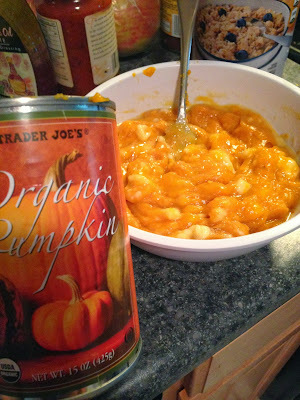 I think there's just something about that pumpkin flavor in the fall -- it's comforting! Especially when you add a cup of coffee to whatever pumpkiny treat you're enjoying.... Mmm. It doesn't hurt that pumpkin is super healthy, as long as you're buying plain pureed pumpkin (not pumpkin pie filling) with no added sugar or anything else. It's full of fiber! One way I've been incorporating pumpkin into my diet is by adding a scoop to my oatmeal in the morning, along with some almond milk and cinnamon. It's delicious, but the truth is... while making this oatmeal takes a whopping 5 minutes, even that has felt like too much of a hassle lately. I wondered how I could make more of a "grab and go" version for my busy morning... soo, why not toss it all into a muffin pan and bake?? These babies are really making my mornings lately. Throw one (or two) in the microwave for 20 seconds, spread some almond butter or coconut oil on top, pair with a hot cup of coffee.... immediate delicious breakfast! These muffins are full of autumn-y spice and that comforting pumpkin flavor. 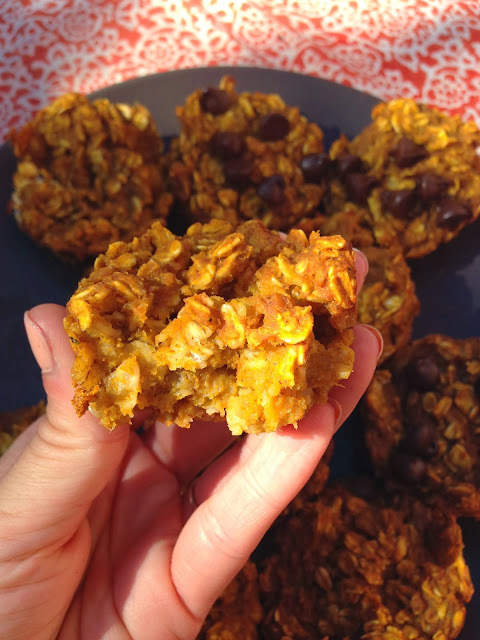 They're moist and dense rather than light and fluffy -- so they're actually more oatmeal-ish than muffin-ish -- which isn't a bad thing, if you ask me. Just important that you know what to expect if you make them! Each one has 100 calories, 1.5 grams of fat, 3 grams of fiber, and 2.5 grams of protein. No flour, no oil, no butter. 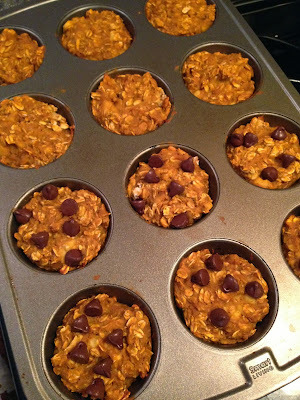 Have 2, or 1 with some nut butter on top, and you have a healthy, filling, tasty breakfast! 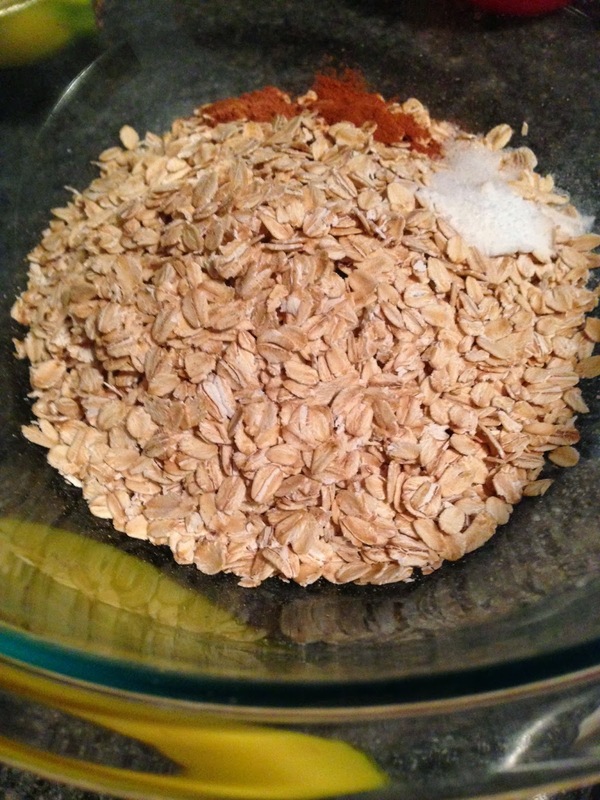 In a large bowl, combine 2 cups of old-fashioned rolled oats, 1/2 tsp cinnamon, 1/4 tsp sea salt, and 1/4 tsp nutmeg. In a separate bowl, mash 1 ripe banana until smooth. 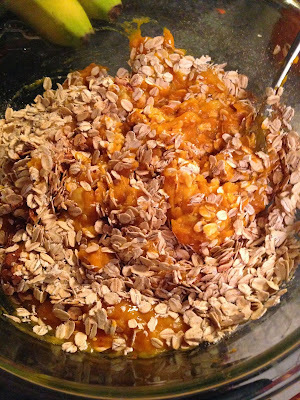 Add in 1 can of pumpkin, 1 egg, 1/4 cup honey, and 1/2 cup almond milk, and mix until smooth. 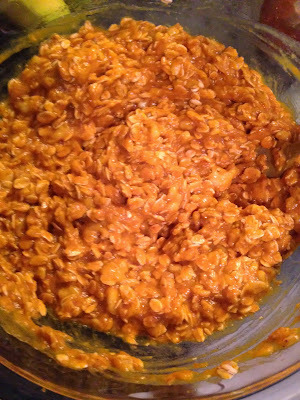 Add the wet mixture to the oats. Pour evenly into a muffin pan sprayed lightly with nonstick cooking spray. You should have enough for about 12 medium sized muffins. If you'd like, sprinkle a few dark chocolate on tops of some or all of them. Let cool, then remove with a plastic knife. Enjoy immediately or save for later! 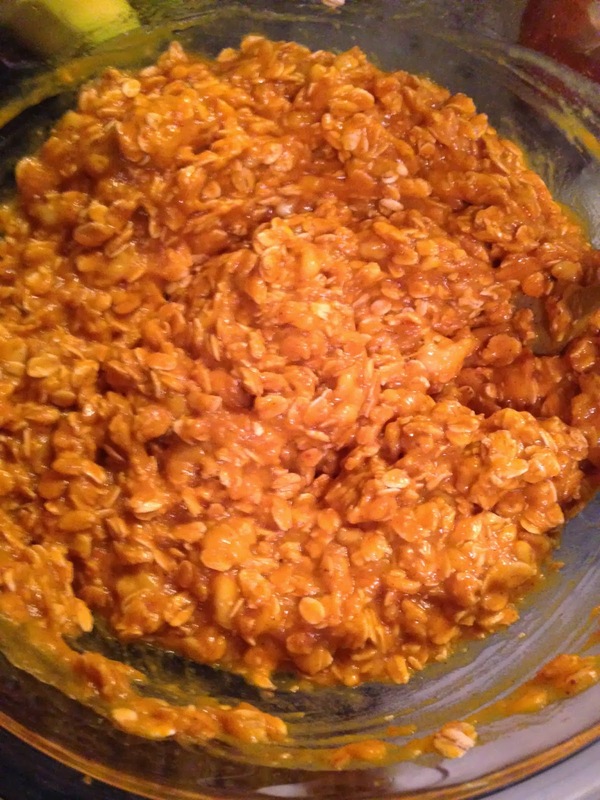 -In a large bowl, combine oats, baking soda, salt, cinnamon, and nutmeg. Mix. -In another medium bowl, mash banana completely with a fork until smooth. Whisk in the egg. Add the pumpkin, milk, and honey. Whisk until smooth. 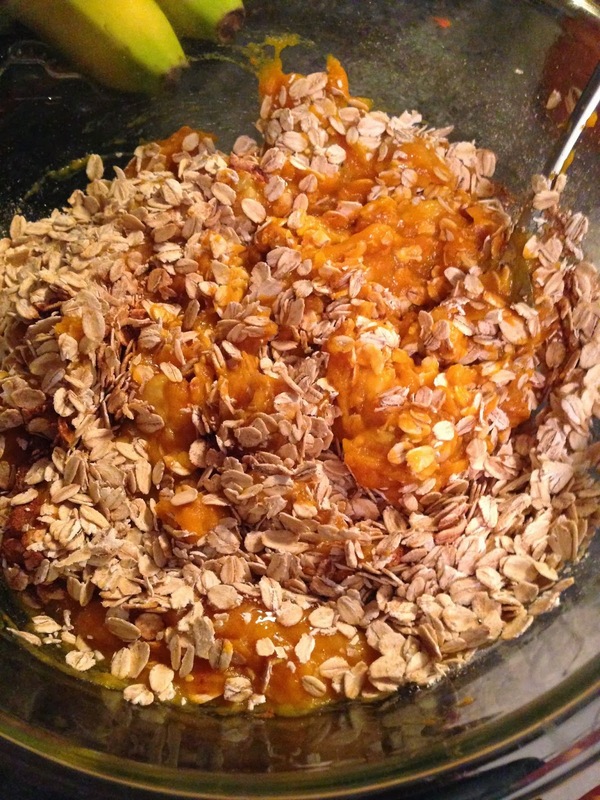 -Pour the wet ingredients into the dry ingredients. Stir until combined. -Spray a nonstick muffin pan with cooking spray. Spoon the mixture evenly into the cups, filling about 3/4 way. If you'd like, top each muffin with a few chocolate chips. -Bake for about 25 minutes, or until a knife inserted in the center comes out clean. yummmmmmmmmmm making a batch asap! 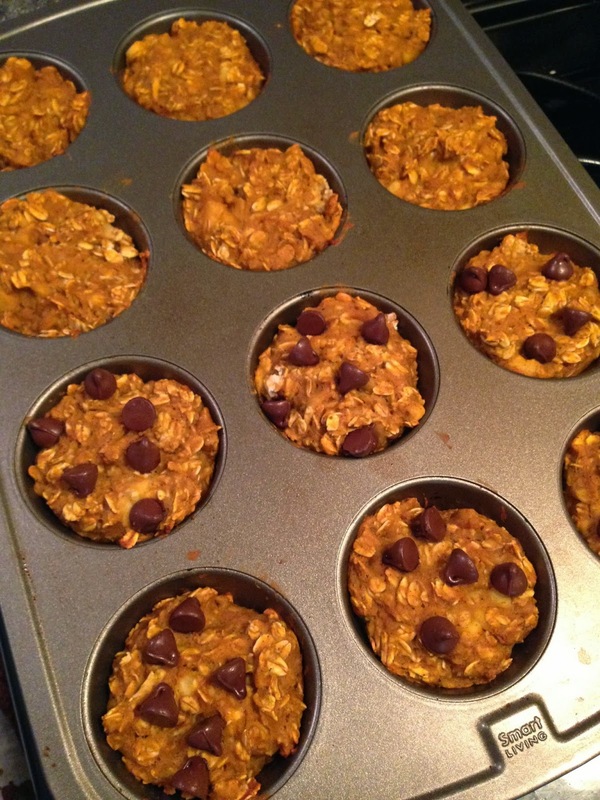 5 or 6 chocolate chips are totally worth it :) These look delish! Glad you jumped on the bandwagon! I'm totally on the pumpkin bandwagon too this year. Mix it with coffee and you have a little bit of heaven! Recipe looks great can't wait to try it! The recipe explanation calls for baking soda, but it isn't listed as an ingredient. How much baking soda is needed? I just made them and took a guess. They smell amazing, but they didn't rise. oops! thanks for pointing that out. you should use 1/2 tsp of baking soda, but even with it I have found that these don't rise much due to the lack of flour. they are more oatmeal-ish than muffin-ish, so as long as you're okay with that I think foregoing the baking soda altogether is also just fine. Made these yesterday for breakfast for the week. They are great. Going to add a touch of ginger to the next batch. Tastes like baked oatmeal and is satisfying! Love the idea of adding ginger! Made these today and they were delicious. Thanks for the great recipe! What size can of pumpkin are you using? I can't wait to try these!!! Oops, good question! I use a 15 oz can. Perhaps you could add these changes to the actual recipe... 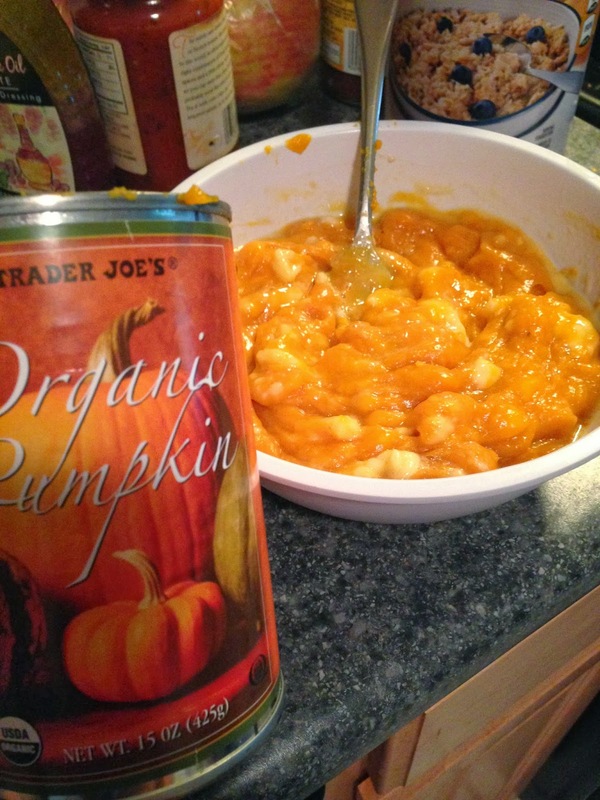 I just wasted an entire batch of ingredients by using too large a can of pumpkin. 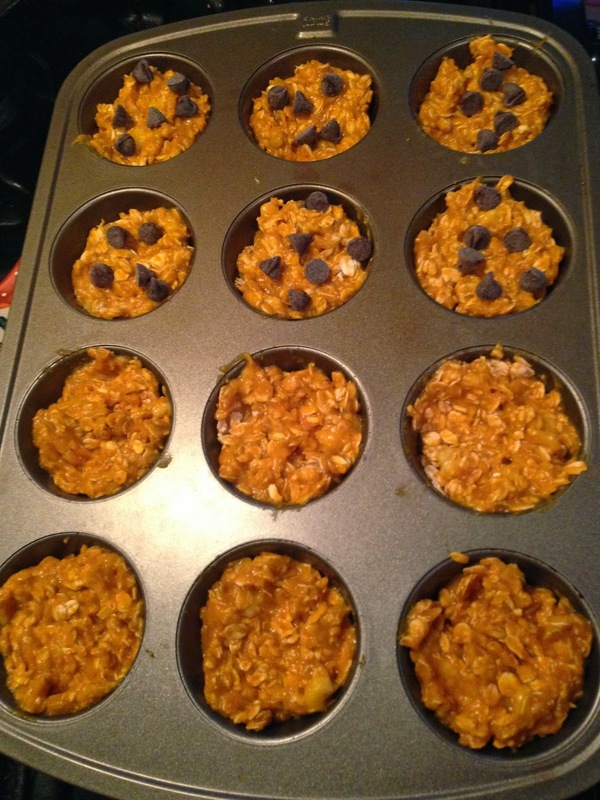 I just made these muffins and they were delicious! I'm always looking for healthy options and this was an excellent find! I used maple syrup instead of honey (because I ran out) and added raisins for the kids. Thanks for the great recipe!! Would canned sweet potato sub for the pumpkin and taste similar? Thanks! The flavor would be slightly different but not necessarily in a bad way! I definitely think it could work! What is the serving size and nutritional information?